Chris Oakley joined the Purdue Center for Plant Biology (CPB) in January 2017 as an Assistant Professor in the Department of Botany and Plant Pathology. 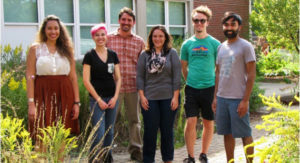 He is one of ten new faculty positions since 2015 in an effort to expand research and education in basic plant biology. Professor Oakley received his B.S. 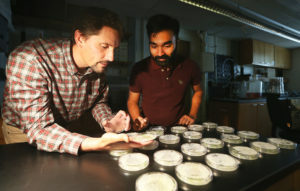 in Botany from the University of Washington and his M.S and Ph.D. in Biological Sciences at Florida State University, followed by a postdoctoral position in the Department of PlantBiology at Michigan State University. He is broadly interested in plant ecological and evolutionary genetics. 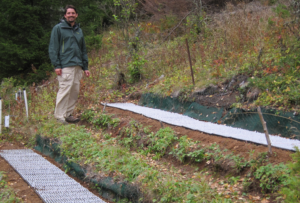 I’m driven by understanding the mechanisms of how natural plant populations adapt to local conditions. One genotype doesn’t do the best everywhere, and it’s likely that there’s trade offs across environments. I’m mainly focused on abiotic stress, which is the negative impact of a non-living environmental factor. I work on freezing tolerance, flowering time, and other traits related to adaptation to different climates.If we can understand the genes that underlie fitness trade offs in a model system like arabidopsis, which is what I work on, we can use that to inform crop improvement efforts. We’re never going to have a line that’s 100% freezing tolerant, resistant of all pathogens and grows perfectly, but my goal is to find the best possible balance of all of those things. Why should graduate students choose Purdue? The first thing is the large community of plant biologists available to students across the College of Agriculture. The PULSe interdisciplinary graduate training programs are one way to leverage this large community of people working at very different levels of biological organization. Students can really do interdisciplinary work here. Purdue’s institutional support allows us to do things like build new phenotyping facilities and expand the CPB, where there’s seed grants and countless resources available to facilitate new collaborations. With 10 new hires in the CPB, there’s a lot of energy and new ideas at work. It’s a really exciting time to do research here. Why do you think it’s important for students to find strong mentors early in their career? I’ve had great mentors, and I can see what that did for me. A good mentor will help you identify your weaknesses, as well as accentuate your strengths and encourage interdisciplinary thinking. I like to have an open door policy with graduate students, even if I’m not on their advisory committee. If students want to drop by and talk to me about research ideas, or if they have a problem, or if they need to use a piece of equipment I have, I’m all for that. My job is to understand what the student wants to do, and then do everything I can to help them get there. What three words best describe Purdue?